1. Department of General Surgery, Chinese PLA General Hospital, Beijing, China. 2. Department of Special Medical Treatment-Respiratory Disease, Beijing Shijitan Hospital, Capital Medical University, Beijing, China. 3. Department of Breast Surgery, Beijing Luhe Hospital, Capital Medical University Beijing, China. Purpose: Triple-negative breast cancer (TNBC) has attracted more attention both clinically and experimentally because of its high-risk biological characteristics and lacking of effective treatment method. The purpose of this retrospective study was to find out the incidence of triple-negative breast cancer (TNBC) in all kinds of breast cancers and to compare and analyze the clinicopathological features, recurrence, metastasis and prognosis of patients with TNBC and non-triple negative breast cancer (non-TNBC). Methods: A total of 1578 female patients with primary breast cancer were diagnosed and treated at the department of General Surgery, the Chinese PLA General Hospital, China, from Jan. 2004 to Jun. 2009. The 1578 breast cancer patients were divided into two groups: the TNBC group and the non-TNBC group. The clinical features and prognosis of the two groups were compared. Results: The incidence of TNBC was 20.41%. Compared with the non-TNBC, the TNBC were characterized as younger age, higher histological grade, higher rate of positive lymph node, bigger tumor size, higher clinical stage at diagnosis, higher histological grade, quicker and easier recurrence and metastasis and lower 5-year DFS rate and 5-year OS rate. The metastasis of TNBC had obvious organic tendency. The lungs, liver and brain were the first three most common sites of metastases. The information of age, the tumor size, lymph node status, clinical stage, histological grade, pathological types and operation method, especially the age and lymph node status play the important roles in judging the prognosis of TNBC. Conclusions: According to this study we found that TNBC was a distinct subgroup of breast cancer with particular clinicopathologic behavior. Compared with the non-TNBC, TNBC was characterized by more aggressive behavior, and lower DFS and OS rate. The metastasis of TNBC had obvious organic tendency. The information of age, the maximum diameter of the tumor, lymph node status, clinical stage, histological grade, pathological types and operation method, especially the age and lymph node status played the important roles in judging the prognosis of TNBC patients. Breast cancer has become one of the most common cancers in women all over the world. It is a heterogeneous disease (1). According to the gene expression profiling, it is divided into five subtypes: luminal A, luminal B, normal breast-like, human epidermal growth factor receptor2 (HER2) overexpression, and basal-like (2, 3). Basal-like breast cancers express low level of estrogen receptor (ER) and HER2; in other words, clinically, they are often TNBC (1, 2, 4). TNBC is a special subtype of breast cancer (5, 6). According to ASCO guideline and the latest St Gallen consensus, TNBC occurs only if there is no expression of ER, progesterone receptor (PR), and there is neither expression nor amplification of HER2 in a tumor (7, 8). TNBC has attracted more attention both clinically and experimentally because of its high-risk biological characteristics and lacking of effective treatment method. The purpose of this retrospective study is to find out the incidence of TNBC in all kinds of breast cancers and to compare and analyze the clinicopathological features, recurrence, metastasis and prognosis of patients with TNBC and non-TNBC. Between Jan. 1st, 2004 and Jun. 30th, 2009, a total of 1578 female patients with primary breast cancer confirmed by surgery and pathological examination were retrospective analyzed in the authors' center. Among of them, 322 patients (20.41%) with TNBC and 1256 patients with non-TNBC histopathologically confirmed were retrospectively analyzed in this study. The relevant characteristics of the two groups were compared. Patients' demographics were obtained from pathographies. Tumors were pathological diagnosised according to the WHO histological classification of breast tumor, graded according to the modified Patley-Scarff scoring system and clinical staged according to the TNM criteria. The enrolled patients met the following criterion: (I). Patients with pathologically proved TNBC or non-TNBC. (II). Cases with the complete clinical, pathological and follow-up data. The exclusion criteria were as following: the patients with ductal carcinoma in suit, recurrent breast cancer, metastatic breast cancer. We categorized the patients as triple-negative if they were negative for ER, PR, and HER2/ErbB2. The status of ER, PR and HER2 were determined by the immunohistochemical staining (IHC) and/or fluorescence in situ hybridization (FISH) after surgery at the department of pathology, the Chinese PLA General Hospital. The formalin-fixed paraffin-embedded histological sections were central reviewed and the diagnoses were confirmed by two dedicated breast pathologists. IHC analysis to determine ER/PR status was performed by using standard procedures on 4-μm sections of paraffin-embedded tissues stained with monoclonal antibodied for ER and PR. Assessment of ER and PR status was carried out according to the Reiner Score. According to a guideline recently published ER and PR status should be considered negative with less than 1% positive tumor cells (7). Before publication of this guideline a cut-off≤10% positive tumor cells was widely accepted and in common clinical use. Our patients group was defined to have a negative ER and PR status according to the predetermined defined cut-off of ≤10%. The HER2 was assessed by means of IHC or FISH. IHC was scored on a qualitative scale from 0 to 3+ based on interpretation of membranous staining intensity, where 0 and 1+ was classified as negative, 2+ as borderline, and 3+ as positive. HER2 (++) tissues were re-evaluated by FISH analysis and if the HER2 gene amplification copy-to-CEP17 ratio greater than 2.0 was accepted as HER2 positive. All patients underwent surgical treatment of breast cancer. The preoperative chemotherapy and postoperative adjuvant therapy was administered based on the recommendations of the National Comprehensive Cancer Network guidelines (NCCN). We followed the patients by regular reexamination in outpatient dept and telephone. We chose the date of surgery as the start time of the follow-up and the time of death or Jun. 30th, 2014 as the deadline of the follow-up. The median duration of follow-up was 92 months (range 60-125 months). Local recurrence is defined as the recurrence occurring in the affected side of breast or regional lymph node. Distant metastasis is defined as the clinical or radiographic examination showing a distant metastasis. Disease free survival (DFS) was defined as the time from diagnosis of breast cancer to first loco-regional or distant recurrence. Overall survival (OS) was the time from breast cancer diagnosis to death. The retrospective study was processed complying with the ethical principles of the Helsinki Declaration with the approval of the ethics committee. All statistical calculations were performed using the SPSS 17.0 statistical software. To compare the demographics and tumor characteristics between the patients with TNBC and non-triple negative breast cancer using a χ2- test for frequencies. We used a Kaplan-Meier method to estimate survival functions and a log-rank test to compare the survival functions among the two groups. Logistic regression was used to identify effects of independent prognostic factors for the rate of DSF and the rate of OS in TNBC. For all analyses, p-values were two-sided and considered to be statistically significant if p-values were <0.05. A total of 1578 breast cancer patients were included in this study. They were divided into two groups according to the results of IHC and/or FISH: the TNBC group and the non-TNBC group. TNBC had 322 patients (20.41%). Compared with non-TNBC group, patients in group TNBC had the following features: higher ratio of patients <35 years (13.98% VS 5.18%, P=0.012); higher ratio of patients with family history of breast cancer (11.49% VS 4.54%, P=0.031); higher ratio of tumors with maximum diameter ≥5cm (12.73% VS 5.49%, P=0.044); higher ratio of patients with positive lymph nodes (64.60% VS 48.01%, P=0.0l1); higher ratio of tumors in clinical stage III (27.95% VS 14.25%, P=0.007); higher ratio of tumors in histological stage III (21.43% VS 11.70%, P=0.028). The comparisons of clinicopathological features between the two groups are outlined in Table 1. The median duration of follow-up was 71 months (range 60-84). During this time a total of 258 patients occurred recurrence or metastasis. The rate of recurrence and metastasis in TNBC group 27.95% (90/322) which differed significantly compared to the rate in non-TNBC group was 13.38% (168/1256). The rate of recurrence in TNBC group 7.45% (24/322) which differed significantly (p=0.031) compared to the rate in non-TNBC group was 2.31% (29/1256). The rate of metastasis in TNBC group 20.50% (66/322) which differed significantly (p=0.038) compared to the rate in non-TNBC group was 11.07% (139/1256). The distribution of the metastatic disease occurred in the TNBC group was following like this: 50% (33/66) in the lungs, 25.76% (17/66) in the liver, 18.18% (12/66) in the brain, and 6.06% (4/66) in the bones which differed significantly (p=0.04, 0.031, 0.029, <0.001) compared to the rate in non-TNBC group were 17.98% (25/139) , 14.39% (20/139) , 5.76% (8/139) , 61.87% (86/139). The comparison of recurrence and metastasis between the two groups are outlined in Table 2. During the period of observation 90 patients occurred recurrence or metastasis, 37 patients died from breast cancer in TNBC group. The 5-years DFS and OS were 72.05% (232/322) and 88.51% (285/322) which differed significantly (p=0.003, 0.031) compared to the rate in non-TNBC group were 86.62% (1088/1256) and 95.46% (1199/1256). We used a Kaplan-Meier method to estimate survival functions and a log-rank test to compare the survival functions among the two groups. We found that the 5-years DFS and OS were significantly lower in TNBC group than those in non-TNBC group. The comparisons of DFS and OS between the two groups are presented in Figure 1 and Figure 2. In the univariate analysis, patient's age, tumor size, lymph node status, clinical stage, histological grade, pathological type, and surgical treatment method were found to have significant impact on DFS of TNBC. However, only tumor size, lymph node status, and clinical stage were significant for OS of TNBC (Table 3). In the multivariate Logistic regression analysis, patient's age, lymph node status, histological grade were found to have significant impact on DFS of TNBC. However, age, lymph node status were significant for OS of TNBC (Table 4). Comparison of DFS between TNBC group and non- TNBC group. During the period of observation 90 patients occurred recurrence or metastasis in TNBC group and 168 patients in the non-TNBC group. The 5-years DFS was 72.05% (232/322) which differed significantly (p=0.003) compared to the rate in non-TNBC group were 86.62% (1088/1256). The 5-years DFS was significantly lower in TNBC group than those in non-TNBC group. Comparison of OS between TNBC group and non- TNBC group. During the period of observation 37 patients died from breast cancer in TNBC group and 57 patients in the non-TNBC group. The 5-years OS was 88.51% (285/322) which differed significantly (p=0.031) compared to the rate in non-TNBC group was 95.46% (1199/1256). 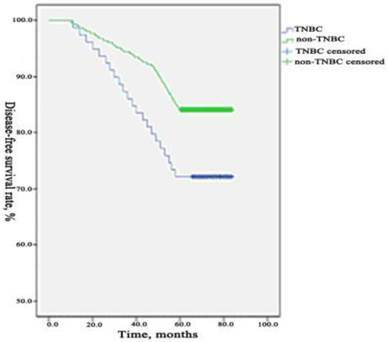 The 5-years OS was significantly lower in TNBC group than those in non-TNBC group. TNBC is a special subtype of breast cancer which accounts for approximately 10-20.8% of all breast cancer subtypes around the world (9, 10) and 10%-17% in western countries (11). The African-Americans and Hispanic white women have the highest incidence rate of all, reporting up to 30% (12-14). The incidence has the significantly regional and ethnic differences which may be related to some genetic or biological differences, as well as environmental factors (15, 16). In our study among 1578 patients, 20.41% were TNBC, which is approximately consistent with results from other previous studies. The relevant research showed that the median onset age of TNBC was 50.0 years old, less than the median onset age of non-TNBC which was 57.5 years old (17). Another research showed that 57.8% of the patients with TNBC were premenopausal women, the median onset age was 49.8 years old, compared with the non-TNBC , the patients with TNBC age < 35 years old were more the non-TNBC (18,19). In our study, the median onset age of patients with TNBC was 50.4 years, compared with the non-TNBC, age < 35 years old were also more. The results coincide with the reports. Some studies reported that the TNBC group had the higher rate of the family history of breast cancer than the rate in non-TNBC group (18, 19). In this study, the rate of the people who had the family history of breast cancer in TNBC group was statistically significant higher than that in the non-TNBC group. The result suggested that TNBC have the familial inheritance tendency. TNBC had great relevance with the breast cancer which had the BRCA1 gene mutation. In our country the rate of familial BRCA1 mutation was 8%, and the people with BRCA1 gene mutation were more likely to have breast cancer, the risk coefficient was 60%-80%, mostly of those breast cancer were TNBC (20). A foreign study showed that about 75% of the TNBC were BRCA1 relative breast cancer, however, about 80%-90% of the BRCA1 relative breast cancer were TNBC (21). The breast cancer with BRCA1 gene mutation indicated poor prognosis (22, 23). 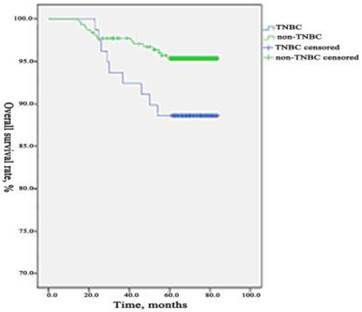 Compared with non-TNBC, TNBC was correlated with larger tumor size, more positive axillary lymph node, higher clinical stage and higher histological grade, which were consistent with previous reports (11, 18, 19, 24). Histological grade was an important factor in judging prognosis of breast cancer. High histological grade was an important factor in leading to poor prognosis. It was reported that the pathological type of TNBC was similar with non-TNBC, but the rate of invasive ductal carcinoma in TNBC was higher that of in non-TNBC (19). But in our study, the rates of invasive ductal carcinoma in TNBC and in non-TNBC were all high, which did not differ significantly. The discrepancy may be due to different ethnic backgrounds of the cohorts. Identification of the exact reasons would require multicenter trials with more patients. Dent et al. (24) conducted a long-term follow-up of 1608 breast cancer patients and found that the recurrence of TNBC had no correlation with the tumor size and the recurrence and death mainly occurred in the first 5 years after diagnosis, especially in the 1-3 years after diagnosis. The incidence of metastases to visceral organs in the TNBC patients was much higher than that in the non-TNBC patients during the first 5 years after diagnosis. Lin et al. (25) analyzed the sites of distant recurrence in 116 metastatic TNBC patients and reported that the majority of metastases were in lungs and liver. The brain was the third most common site of recurrence. Similarly, in another study, the rate of lung metastases and the rate of liver metastases in TNBC group were all higher than those in the non-TNBC group and differed significantly, however, the rate of bone metastases and the rate of brain metastases in TNBC group were all higher than those in the non-TNBC group but differed not significantly. Rakha et al. (11) reported that in a study of 1944 breast cancer patients, local relapse and metastases occurred earlier in TNBC patients. The rate of visceral organs metastases was higher than the rate of bone metastases. According to analyses our study, the rate of local relapse and the rate of metastases in TNBC group were all higher than that in the non-TNBC group. The lungs, liver and brain were the first three most common sites of metastases. In all sites of metastases, the proportion of lungs metastases, the proportion of liver metastases and the proportion of brain metastases in the metastatic patients of the TNBC were respectively higher than those in the metastatic patients of the non-TNBC, which all differed significantly. The result of our study was consistent with previous reports. The metastases of TNBC had a certain organ tendentious, which may be related with the expression of the specific gene (25-27). In the study of 55 TNBC patients who developed brain metastases, the frequency of ER-negative, cytokeratin 5/6 positive, and epidermal growth factor receptor (EGFR)-positive tumors was higher than that observed in a comparison group of patients who did not have brain metastases (25). Andy et al. (27) reported that the gene, which they denote as promoting lung metastagenicity, encode extra-cellular products including growth and survival factors (for example the HER/ErbB receptor ligand epiregulin), chemokines (CXCL1), cell adhesion receptors (for example ROBO1) and extracellular proteases (MMP1). They also include intracellular enzymes (for example COX2) and transcriptional regulators (for example ID1), as well as several other downregulated genes. Their expression pattern is tightly correlated with lung metastatic activity. When tested by overexpression in poorly metastatic cells or by RNAi-mediated knockdown in highly metastatic cells, several genes in this group function as mediators of lung metastasis but not bone metastasis. Furthermore, in the cohort of human breast cancer primary tumours examined, those expressing the lung metastasis signature had a significantly poorer lung-metastasis-free survival but not bone metastasis-free survival. This signature therefore seems to include a set of clinically relevant genes that mediate a metastagenicity function with selectivity for the lung (28, 29). TNBC is prone to occurred distant metastasis, which may be one of the reasons for its poor prognosis. Furthermore, TNBC is prone to local relapse, we should be cautious when we choose to do the breast-conserving surgery. Rakha et al. (11) reported that in a study of 1944 breast cancer patients, the rate of DFS and the rate of OS in TNBC patients were all much lower than those in non-TNBC patients. Haffty et al. (30) showed 5-year DFS rate of 67% in the TNBC, compared to 82% in the non-TNBC. Another research data showed that (18) 5-year DFS rate of 73.7% and 5-year OS rate of 88.5% in the TNBC, compared to 80.8%, 92.8% in the non-TNBC, which all differed significantly. Our study showed that the 5-year DFS rate and 5-year OS rate in the TNBC were all significantly lower than those in the non-TNBC, which was similar to other reports. The slightly different survival rates among these studies may be caused by personal circumstances, treatment methods, and different levels of medical care in local hospitals (31, 32). The reason for the poor prognosis of TNBC may be special biological characteristics such as younger age, higher rate of breast cancer family history, bigger tumor size, more advanced clinical stage upon diagnose, higher rate of lymph node metastasis, higher histological grade, earlier recurrence and metastasis and non-susceptibility to endocrine and targeted therapy (18, 19). Bauer et al. (33) and other reports (34) showed that clinical stage and histological grade are significantly related to the prognosis of TNBC, the higher pathological stage and histological grade of the tumor, the lower the DFS and OS of the patient. Furthermore, patient with positive lymph nodes have a poor prognosis. However, another study analyzed the relationship between the number of the positive lymph nodes and the prognosis of the TNBC but found nothing significant correlation (35). In our study, according to the univariate analysis, patient's age, tumor size, lymph node status, clinical stage, histological grade, pathological type, and surgical treatment method were found to have significant impact on DFS of TNBC. However, only tumor size, lymph node status, and clinical stage were significant for OS of TNBC. In the multivariate Logistic regression analysis, patient's age, lymph node status, histological grade were found to have significant impact on DFS of TNBC. However, age, lymph node status were significant for OS of TNBC. The incidence of TNBC was 20.41% in all kinds of breast cancer. TNBC was a distinct subgroup of breast cancer with particular clinicopathologic behavior. Compared with the non-TNBC, TNBC was characterized by more aggressive behavior, and lower DFS and OS rate. The metastasis of TNBC had obvious organic tendency. The information of age, the maximum diameter of the tumor, lymph node status, clinical stage, histological grade, pathological types and operation method, especially the age and lymph node status played the important roles in judging the prognosis of TNBC patients. Lacking of the expression of ER, PR, and HER2, so it cannot be benefit from endocrine therapy and molecular targeted treatments for HER2. In the future, we should focus on understanding the molecular biology characteristics of TNBC, elucidating its mechanism at the molecular level, deciphering the gene expression profiles of TNBC and researching and developing new therapeutic targets. Try to find targeted and effective therapies to improve the prognosis of patients with TNBC. This research was supported by the Natural Science Foundation of Beijing, China (Grant number: 7142151).